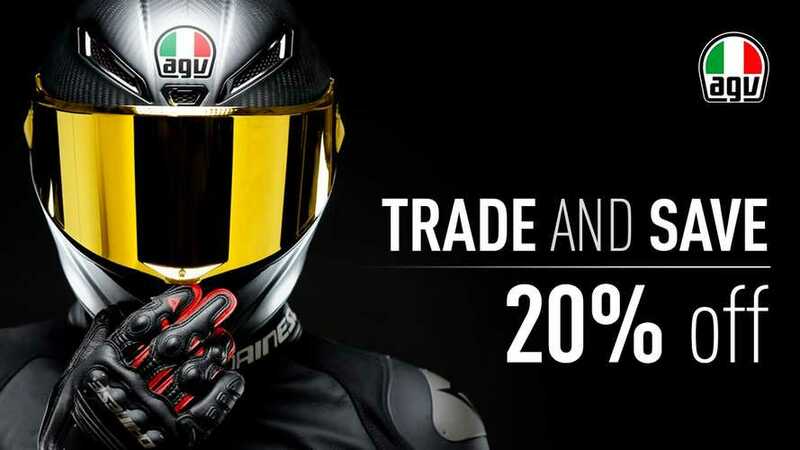 If you have an old helmet you need to replace, and you live near a Dainese store or one of its retail partners, you are in luck to receive 20 percent off your purchase of a new AGV helmet. AGV, owned by Dainese, is running this special from March 15, 2019 until May 15, 2019. They’re calling it the “Trade and Save” program. It is not available by mail order, so you will have to go to a retail store with your mangy old helmet to take advantage of the promotion. Helmet manufacturers recommend that you replace your helmet after between three and five years of use, or sooner if your helmet experiences an impact with your head, or any other kind of heavy object, inside. The interior hard foam compresses on impact, and stays compressed. It does its job once and then it is done. If you are a real sweater, your (ew) bodily fluids can break down the interior of the helmet, too. If you ride in the rain a lot, similarly, and the foam gets or stays damp with frequency, that will also eventually damage it. When you trade your old helmet in they will cut the straps off the helmet and give you a coupon for 20 percent off a new one. There is no word on whether they will dispose of the old helmet for you, but I bet if you just left it behind they’d find it a nice home in a dumpster somewhere. Note, this promotion is not picky and your old helmet can be any brand; it does not have to be an AGV helmet. Take a good look at your current lid, and if there are any signs of wear on the foam, liner, straps, buckle mechanism or anything else, here’s your opportunity to get a spanky new one. When: March 15, 2019 through May 15, 2019. Where: D-Stores and Participating Retail Partners. The AGV Trade and Save program is not available online. How: Bring in an old helmet (any brand) and receive a coupon for 20% off MSRP of a new AGV helmet.